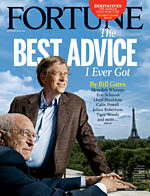 Fortune Magazine’s cover story “The Best Advice I Ever Got” features some great pearls of wisdom for fathers. The father of Bill Gates, William Gates, has some great wisdom to share about raising his son. You can read the entire interview here. There isn’t any benefit to fighting with your parents. It was all about the issues, the battles were going to be about the real world, and they were really on my side. And that was fantastic. It just changed my mindset. I was only 12 or 13 at the time. I think it made things a lot smoother from that point on. Inthon: Our actions as children and parents should definitely mirror that important concept. Honestly expressing your love for your child in a way that your child implicitly knows you care about them and that they can trust that you will be on their side in the long run. Obviously… easier said than done. And the thing that people there taught us and emphasized, which is so significant is that you should never demean your child. Inthon: We all remember when our parents accidentally or intentionally demean us or put us down. They can often overshadow great things that they taught us. As adults, we must be mindful that, no matter what happens, demeaning does not produce positive results. Unless you read different points of view, your mind will eventually close, and you’ll become a prisoner to a certain point of view that you’ll never question. I agree with this principle and I have made it a priority to get my information from radically different and opinionated sources. It has been invaluable in expanding my worldview. This issue of Fortune is on the newsstands now and is definitely worth checking out.